When Tom Schreiber got injured, some Rock fans were worried that the offence wouldn’t adjust. After a few rough outings, they went and scored 14 against New England and 17 against Calgary, and we thought they had adjusted. Well if they did, they adjusted right back on Friday night. 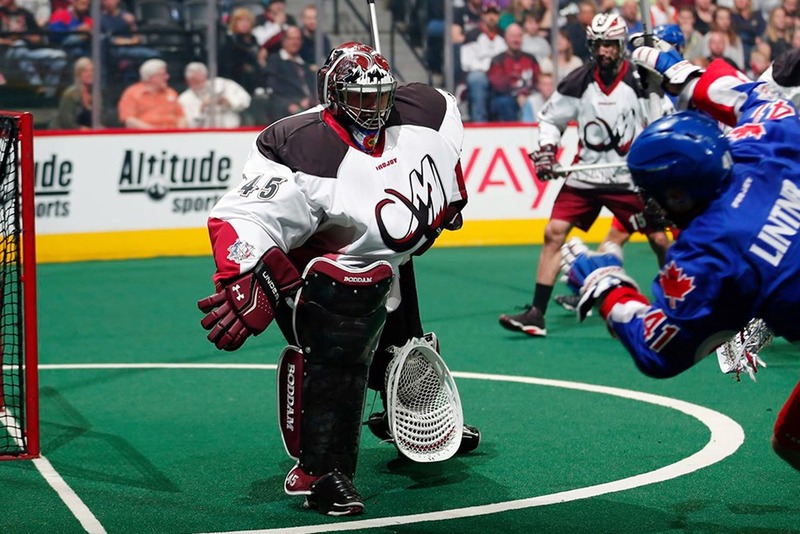 In what might be an NLL first, not a single Rock offensive player scored a goal on Friday night. Kieran McArdle picked up one assist as did Reid Reinholdt (both on the same Challen Rogers goal), but that was it. Adam Jones, Rob Hellyer, Brett Hickey, newcomer Dan Taylor, and Phil Caputo combined for ZERO points. Props to the Mammoth defense who were exceptional at preventing many shots from occurring at all, and to Dillon Ward for stopping those that made it through. I don’t know if there is a scouting report on Ward saying “shoot 5-hole!” but if there is, it was inaccurate on this night. The Rock seemed to be shooting there a lot (if they weren’t hitting Ward in the chest), and he stopped every one of them. It looked as if the Rock forwards were snakebitten again – shooting opportunities would come up and they’d pass instead. Lots of shots were taken from a fair ways out. I won’t say they weren’t trying to get inside but when they did try, the Mammoth D wouldn’t let them. Meanwhile the transition guys were hitting the top corners. It got to the point where the Rock were down by two with three minutes left and I wanted them to send Rogers, Merrill, and Harris out instead of the regular O guys. There was a comment on Facebook from a guy who complained about Nick Rose and suggested that the loss was his fault. Was Rose fantastic in this game? No, there were one or two goals that he probably could have stopped, and a couple of times he made a save though it seemed clear that he had no idea where the ball was. But he played well enough to keep his team in the game which is all you can ask from your goalie. The same commenter said later that sometimes a goalie can “steal” a game for you and Rose didn’t. While that’s true, we don’t get to decide when a goalie should steal a win for you. If your team only scores seven goals, blaming the goalie for allowing more than six is a little unrealistic. Blaming Rose for a loss like this smacks of “I don’t like Rose so I’ll blame him for everything”. So as of right now (Saturday morning), we have four 7-7 teams in the East, and one 6-7. The West playoff picture is mostly set – it’ll very likely be Rush, Mammoth, Roughnecks in that order. The Mammoth could still catch the Rush for first, so something could change there. But in the East, we still have no idea and probably won’t for a couple of weeks. It wouldn’t surprise me if the very last game of the regular season (Georgia @ New England on April 29) decides the playoff fate of the entire East division. Right at the end of the first quarter, a Rock player took a last-second shot on Ward. Mammoth defender Jordan Gilles grabbed the rebound and shot on the Rock net from his own goal line and scored. Top left corner. No bounce. The buzzer went while the ball was in flight so it didn’t count, but it was a beautiful shot nonetheless. The shot clock at one end of the floor was broken for most of the game, so the PA announcer gave teams 10 and 5 second warnings when the clock was running down. It’s the first shot clock problem I remember seeing at Rock games for a number of years, but it did remind me of a few games in one season a long time ago where shot clock problems were relatively frequent. Another weird stat: a week after I wrote an article on unassisted goals, four of the Rock’s seven goals were unassisted. Two more had only assist, and only one goal had two. This means that the Rock had more goals (seven) than total assists (four) in this game.